WildFly use a modular architecture, it assembled by a series of subsystems, each subsystem can be independent or dependent. From designing/programming aspect, it’s independent and pluggable，no interface interaction/implementation between two subsystems, but from service/functionality aspect, it’s dependent, one subsystem can depend on other subsystems’ service. Teiid implement WildFly Core Management/Controller API as a WildFly subsystem, which depend on subsystems’ service/functionality, supply a way to run Teiid in JBoss/WildFly container. 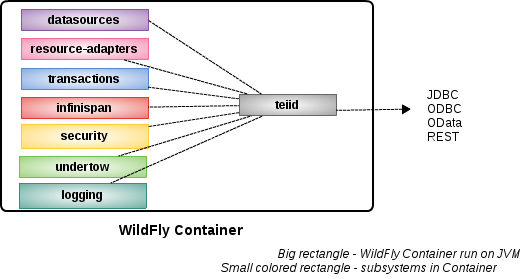 From above figure, the big rectangle is WildFly Container run on JVM, small colored rectangle are subsystems in Container, teiid subsysem depend on other sunsystems(datasources, resource-adapters, transactions, infinispan, security, undertow, logging). JDBC, ODBC, OData, REST are services which Teiid Supplied.